This juicing guide will help you with the nutritional and health benefits of the produce rainbow. Fruit and vegetable juicing is like making a concentrated version of produce into a glass. When you drink it its similar to a transfusion of nutrition straight into your blood stream. 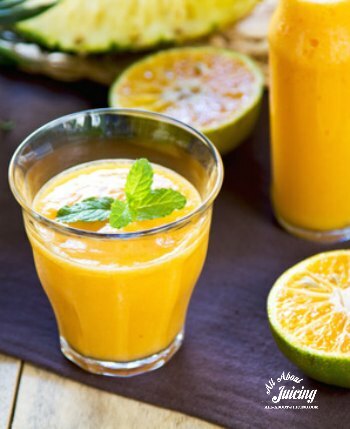 You'll need a good juicing machine and some fantastic fruit juice recipes and vegetable juice recipes. Many of these are articles aimed at helping you juice better, easier and for your juicing health. Whether you want to start a juicing program or just learn more about fresh juice, we hope this helps. Guide For Using Herbs in Juice Want to enhance your juices with herbal remedies? You can learn how here. Find out which herbs to use here. Add Extras To Your Drink To Make It More Healthful There are several things you can add to make your daily drinks power-packed. Fiber, herbs, oils, and more. Make Your Own Aloe Juice Learn the benefits of this better blended than juiced juice. Using Ginger in Juices and Smoothies Learn the benefits of and how to use ginger in tea, juices, smoothies and even make a juice shot. General Guide to Juicing For Children Making juice for the kiddos is a great idea and a great way to get nutrition into thier growing bodies. Not to mention, they usually love it since it tastes so fresh and sweet. The Unjuiceable Fruits & Veggies Ever wonder what you can't juice? Here are some common fruits and vegetables that are better left alone. 3 Reasons to Add Lemon to your Juice Recipes Lemon is awesome! Add it to your juice. Produce Substitutions Need to sub out an ingredient for another? Here is a list to help you do just that. Juicer Gift Ideas Did you ever want to give a juicer as a gift to someone but not sure which one? Check out these recommendations. Gift Ideas for Juicers (people who like to juice!) If you are looking for a gift for a person who likes to juice, these suggestions are safe picks! Top 15 of the Best Fruits and Vegetables to Juice Wondering what to stock up on? Only the best fruits and veggies here! Juicing Kale for Healthy Blood Sugar If you are concerned about sugar consider juicing greens and specifically, kale. Tips For Juicing When You're On The Go Wondering how to effectively juice-to-go? Juicing On A Budget If you are pinching the pennies, read this article. Juice For Cancer This will give you some ideas on why juicing for cancer might be good for you. Juicing for Energy Do you need more energy? Maybe these recipes can help you out! Review Juicers If you're in need of a new juicer, start here. Juicing Help for Beginners Are you new to juicing? This page will help you get started with the basics. Tips on Juicing Greens Greens can be tricky to juice. Here are some tips. Benefits of Turmeric in Juice and Smoothies If you don't know about this root, its a great add in to help inflammation, headaches and other chronic conditions. Juicing for Ailments Use this juicing guide to help you find the proper produce to use if you have a health condition. Fruit Juicing Guide Is fruit juice good for you and your family? It sure is. Here’s why including specific information on juicing various fruits, their nutritional benefits, juice yields and health benefits. Vegetable Juicing Information Vegetables come in all colors. And each color has it’s specific benefits. Discover what they are while learning the benefits of juicing specific vegetables, how to juice them, and their yields.